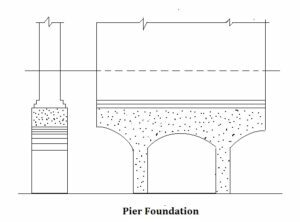 When a heavy structure or building is to be constructed in soft or sandy soil and hard bed stratum for the foundation is situated at the reasonable depth pier foundation is suitably provided for transmitting the load into strong stratum. The diameter of the shaft (In case of square or rectangular pier) should be less than 1/12 th of its height. Sometimes the shaft may be lined with timber to prevent thee side earth sliding. The timber lining is eliminated after filling the shaft with concrete. Generally, reinforce concrete, or grillage cap or concrete arch is used to connect the shafts with each other. The arrangement of pier foundation is shown in the following figure. Also Read – How To Build A Good Formwork? It’s really good for Civil Engineering knowledge. I like it.